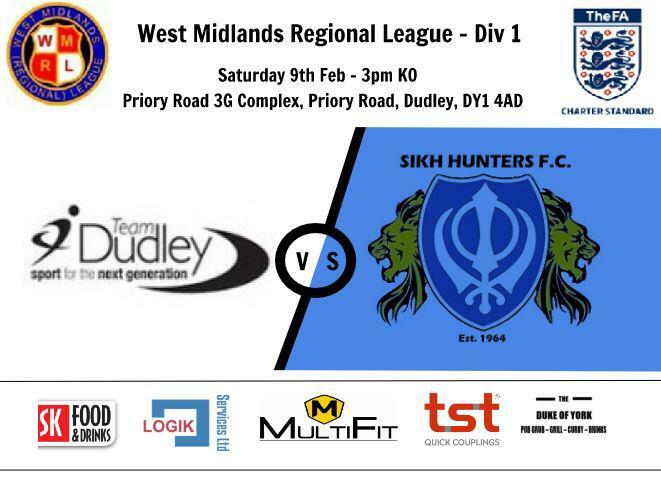 Sikh Hunters maintained their unbeaten run in 2019 on Saturday, with an injury time Todd Perry goal meaning the spoils were shared against fellow high fliers Team Dudley. Hunters made one change from the previous game against Wyrley United, Tyrone Atkinson coming back into the starting line up in place of Jason Hewitt who was named amongst the substitutes, where he was joined by the fit again Mitch Lawley. The opening exchanges were cagey with both sides perhaps conscious of the importance of the fixture, having gone into the game in third and fourth places in the league table respectively. The first clear cut opportunity of the game came on the quarter hour mark as Hinesh Patel got on the ball around halfway before advancing down the left hand side. Despite being clearly held back by a Team Dudley player, Patel got to the byline before cutting the ball back for Atkinson but he couldn't connect cleanly and his effort bobbled wide. Minutes later, the away side found themselves with another presentable opening. Justin Nisbett charged down a clearance from the home goalkeeper and fell to Dan Jones who got away from his man but found nobody on the end of his inviting cross. The visitors were dealt a blow just after the half hour mark when leading goalscorer Nisbett had to come off, Hewitt the man to replace him. The final action of the opening period saw Team Dudley have an effort from distance which Hunters goalkeeper Liam Haynes almost let get away from him but gathered at the second attempt. Into the second half and the visitors came out of the blocks the quicker of the two sides in what was becoming an intriguing contest with Patel at the heart of Hunters' best moves, despite being on the receiving end of some rough treatment from the home side. Patel still managed to get away from 3 players to get a powerful shot away which was tipped over for a corner before moments later, hugely against the run of play, Team Dudley took the lead. With the ball down in the corner, the ball went out behind the goal and to the surprise of everybody, the referee awarded a corner. The ball was then swung in and the Team Dudley striker was left unmarked 6 yards out to head home the opener. Undeterred, the visitors continued to throw everything at the hosts, who were becoming increasingly 'cute' with their sportsmanship as the contest wore on and despite a clear penalty shout for Todd Perry being denied as the game entered injury time, it was fitting that the towering centre half should have the last laugh, steering in Connor Archer's goalbound effort from close range to level up the scores and send the away fans into raptures. A point apiece then as each side end the day as they started it in the league standings. With no fixture this weekend, Hunters are next in action when they travel to Telford Juniors on Saturday 23rd.